As mental health issues arise frequently in the news — through stories on gun violence, homelessness, incarceration and more — there’s been a new emphasis on education. Dr. Alec Miller spoke recently in Westport. He’s a leading expert on dialectical behavior therapy for adolescents — an increasingly popular treatment for people with significant difficulty regulating emotions and behaviors. Because DBT skills are applicable to everyone, it’s being used more and more in school settings. Westport, it turns out, piloted a mental health therapeutic curriculum 4 years ago. Wellness Seminar is a half-credit class at Staples High School. And it may be the first anywhere in Fairfield County. It’s not therapy or counseling, says Thomas Viviano, one of Staples’ 4 school psychologists. 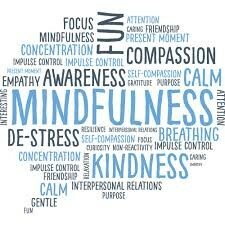 It is a skills group, with an emphasis on mindfulness. Students learn stress tolerance: practical skills to help them cope with negative emotions. For example, when you’re angry you can do an activity you enjoy, or help someone else, rather than focusing on that feeling. Students also learn interpersonal skills, like developing healthy relationships, maintaining self-respect, and skillfully dealing with peers, teachers and parents. Parents meet monthly, to learn the same skills as their youngsters. That helps reinforce DBT at home. Each class includes 15 or so students, and is co-taught by a social worker and psychologist. The class, Viviano emphasizes, is applicable to everyone. The skills prepare students for college, including dealing with roommates and professors, and help them with problem-solving and decision-making, and for general problem-solving and decision-making. Students say say they used “pleasant imagery” to ease stress before a test; employed the “cope ahead skill” to feel calm during a presentation, and do coloring at night to fall asleep more easily. Maintaining good mental health is a complex issue. At Staples, Wellness Seminar is an important first step. This entry was posted in Education, Staples HS, Teenagers and tagged Mindfulness, Thomas Viviano. Bookmark the permalink. I’m so happy to read this. I went through a DBT class several years ago and I’ve thought that the mindfulness skills I’ve learned should be taught in schools to help children cope with life. Wonderful! There are two local websites which provide further information on mental health and mental wellness issues. One is “turningpointct.org” which was created by and is targeted specifically to young adults. The other site is “healthymindsct.org”.